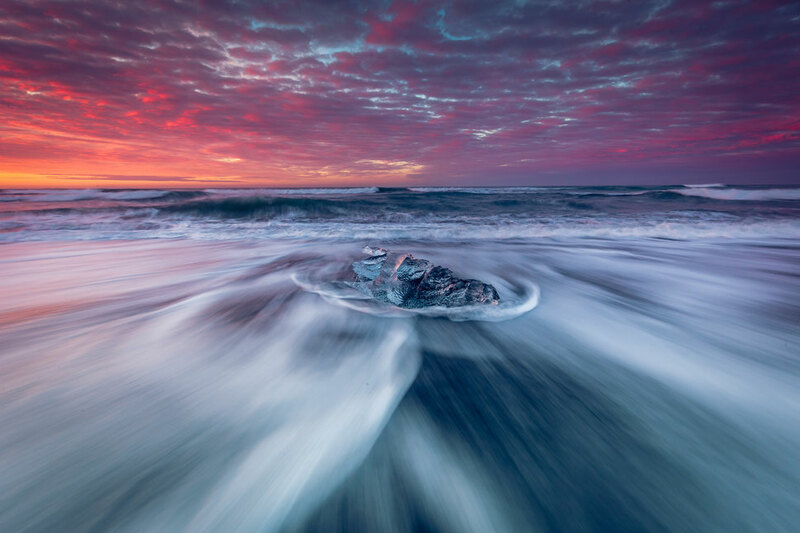 Photographing Iceland. 10 Day Road Trip Guide around the Land of Fire and Ice. 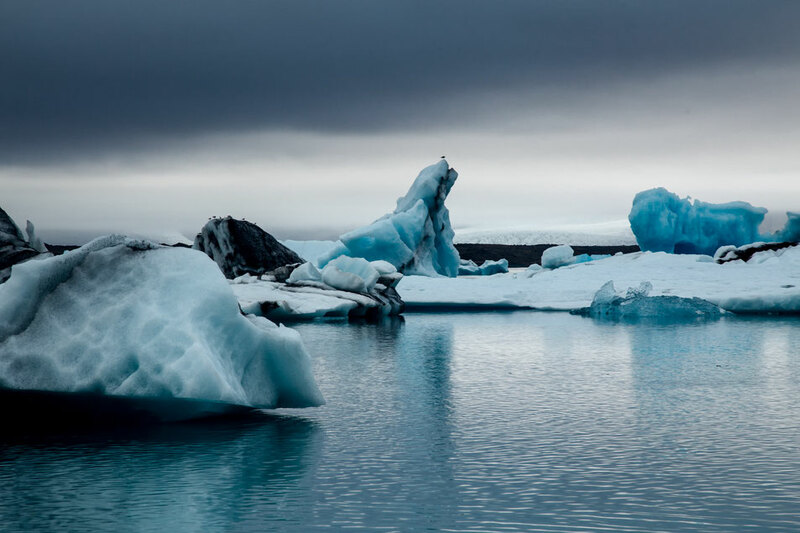 Iceland’s diverse landscape has made it a very popular destination for all kinds of travellers and its small size makes it perfect for people wanting to do self drive road trips. Planning my trip around Iceland has been more time consuming than anticipated. There is certainly a lot of information on the internet, but jumping from website to website was just confusing and frustrating me more and more. I’ve been road tripping around the world for many years now. I’ve lived in some of the most famous road trip destinations around the world: New Zealand, Canada or Tasmania in Australia. What I'm saying is that I know the drill and I know how to design the perfect road trip. When planning your road trip around Iceland accept the fact that you won’t be able to see everything! Learn to prioritize and choose the best spots! As an avid photographer I design my road trips around the most photogenic places in the countries I am currently visiting. 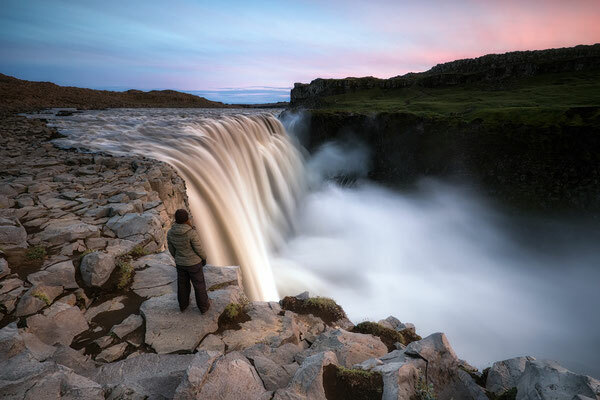 Iceland's volcanic nature coupled with its ferocious climate make for some awesome photography and lifelong memories, but cramming every single attraction in a 10 day itinerary won’t do you any good. Trust me, I’ve learned it the hard way. If you find this itinerary useful you are welcome to use the affiliate links for car, motorhome or hotel bookings enlisted at the end. 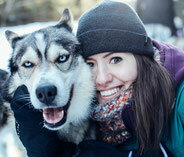 Each time you do I get paid a small commission at no extra cost to you. Thank you. What’s the best way to road trip around Iceland? This itinerary is designed to optimise your time in Iceland as you can’t really afford to waste any. Everything in Iceland is expensive, car rentals, accommodation, petrol, you name it. It’s down to the fact, that they have to import pretty much everything apart from fish (which is still quite expensive actually). Don’t worry though, budget travel is still doable in Iceland, you might just have to follow some of my tips. This is a self drive road trip itinerary so naturally you will need a car to follow it. You can compare car rental prices on Discover Car Hire - my go to website for renting out compact cars around the World. If you were wondering if you need a 4WD to do this itinerary than the answer is NO. A compact and fuel efficient car will be just fine. 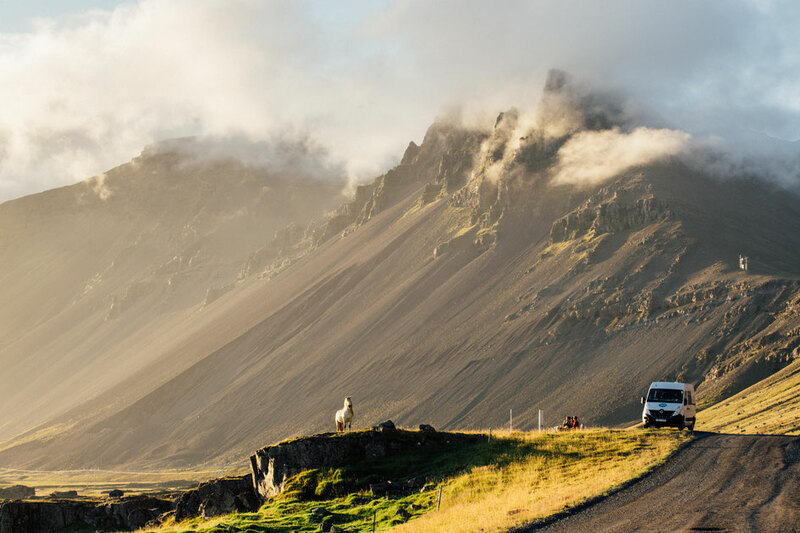 A very popular way to travel around Iceland is renting a campervan. There are plenty of companies who rent out self converted motorhomes on the island. Good luck with comparing them all though! Seriously the amount of options seem to be endless, your time however is not. If you want to get it over with the quick and easy way try Motorhome Republic. The perfect motorhome rental search engine. When renting your car or campervan try to organise pick up at the airport and drop off in Reykjavik. Even though this is a 10 day itinerary you will only need the car for first 8 days. I will explain later. Keep reading! This itinerary is also aimed at people who want to camp around the island. However I did include alternative accommodation options in the places, I've enlisted, in case camping isn't your thing. Due to its volcanic nature, very high latitude and arctic nights, I wouldn’t recommend travelling to Iceland in the winter. Bear in mind that some of the roads may be inaccessible and not maintained in the low season. However, in the summer months and shoulder season this is your ultimate road trip plan (from April to September). Expect high volume of tourists in the peak summer months: July and August. 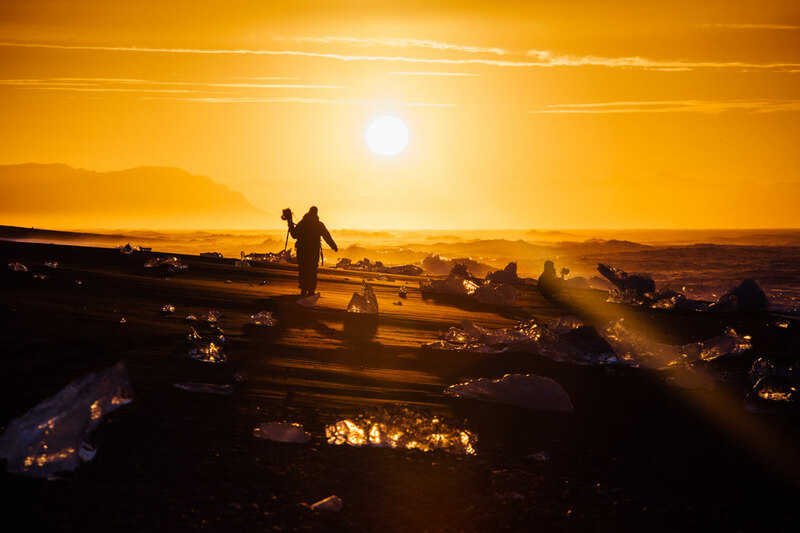 Long gone are the days when Iceland was an undiscovered destination. To give you an overview for the first 8 days this itinerary will take you around the famous Ring Road in a counterclockwise direction. Not only will you visit some of the most photogenic spots on the island, but you will also have a chance to venture off the beaten path and see some of the lesser known spots. 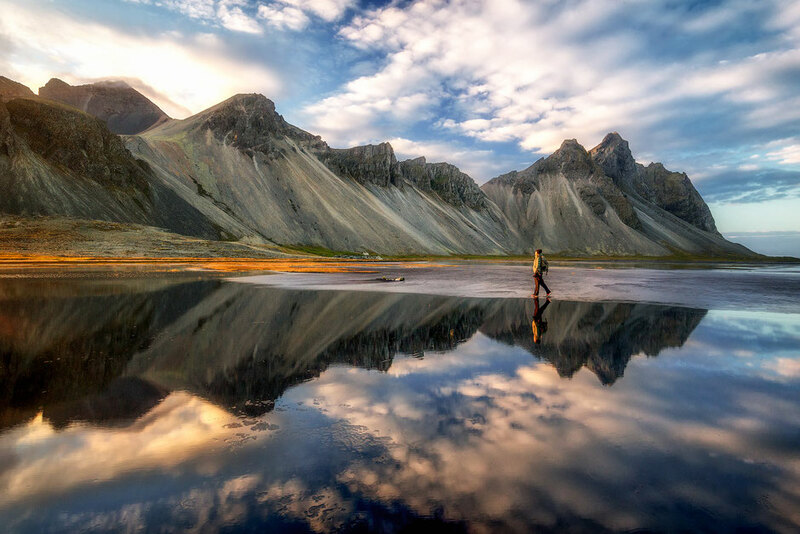 On the 8th day you will drop off your rental car in Reykjavik and jump onto the shuttle bus to Landmannalaugar, a location you absolutely can't miss if you are into photography! Below you can find the map of the whole itinerary. If you click in the top left of the map you will find three separate layers marking the destinations, points of interest and campsites. If you got to Reykjavik early in the morning you can spend the afternoon exploring Iceland's little capital. After stocking up on food in one of Reykjavík’s discount supermarkets – Bonus, it’s time to hit the famous Ring Road. The Ring Road (Highway 1) goes around the entire circumference of Iceland. The first major stop is Seljalandsfoss. Leave Reykjavik late in the afternoon to get to this waterfall before sunset. My tip is to take a decent lens cloth with you because water spray will be relentless. It’s only around an hour and a half (120km) to get there and it’s impossible to miss the signs. You will see the waterfall from kilometres away when driving on the highway. Around 200 meters further down from Seljalandsfoss there is another waterfall hidden in a canyon. Not many people know about it. It's called Gljúfrabúi, and it is located near Hamragarðar campsite. Don't miss it! Before you enter the canyon make sure you're wrapped up in waterproof clothing from head to toe. If you somehow managed to stay dry walking around Seljalandsfoss, you will certainly get wet here! Stay the first night at one of the nearby campsites I marked on the map or in one of the hotels located in the close proximity to the above mentioned attractions. If you decide to stay in Iceland's capital Reykjavik before heading out on this road trip. Try staying in one of these accommodation choices. 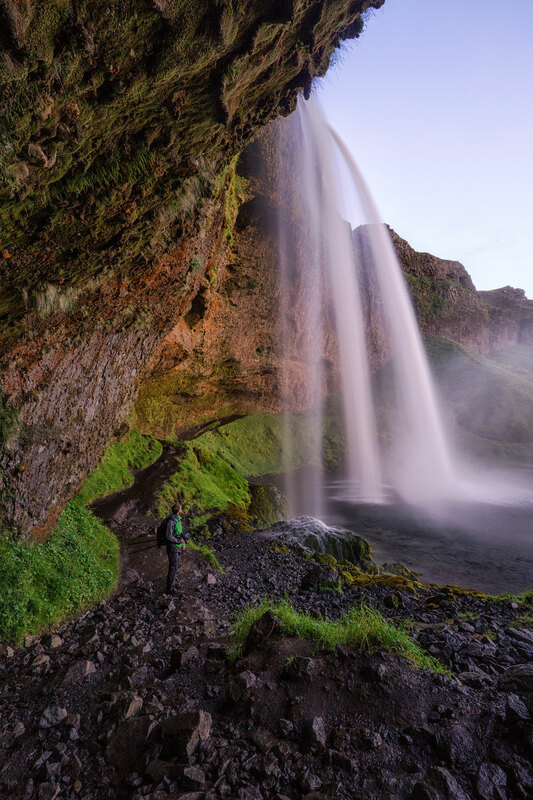 From your accommodation near Seljalandsfoss travel another further (30km) along Iceland’s Ring Road and you’ll get to one of the most famous photography spots on the whole island - Skogáfoss. 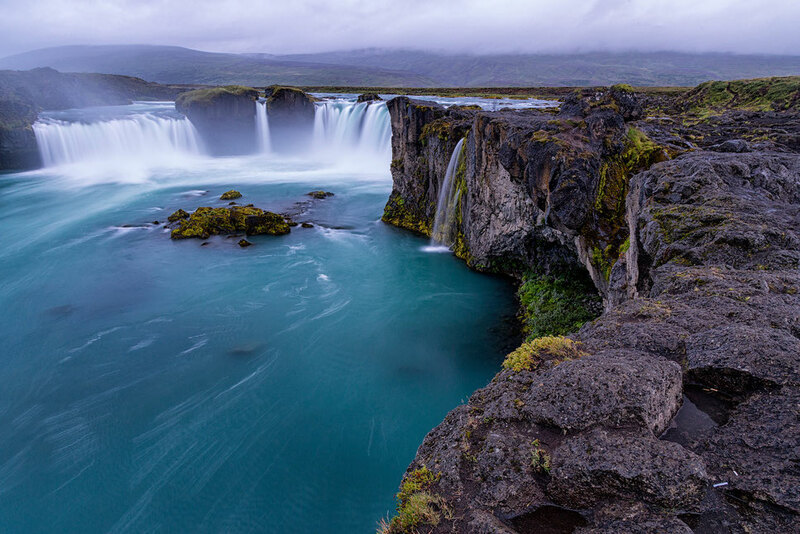 This huge waterfall is so iconic that it’s exactly what comes to my mind when I think of Iceland. Well that, and my diminishing bank balance. Seljavellir hot springs - a big no no! You may have heard of the Seljavellir hot springs located around half way between Seljalandsfoss and Skogafoss. A lot of people still choose to visit this place, but I wouldn't recommend it to anyone. The old swimming pool built back in 1923 hasn't seen any maintenance for a long time. The water in the pool is very dirty and its temperature is lukewarm at most. There will be other awesome hot springs along the Ring Road so don't bother with this one. 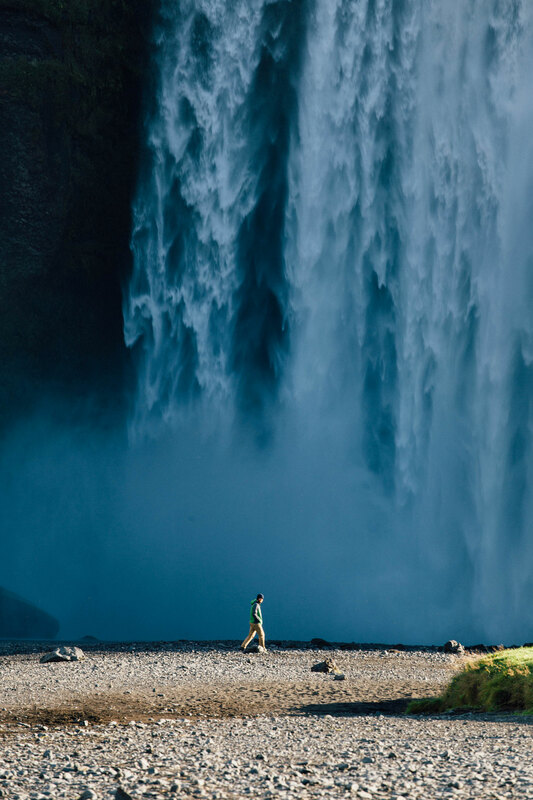 Once you get to Skogafoss there is a short but relatively steep hike up the stairs built on the right side of the waterfall. 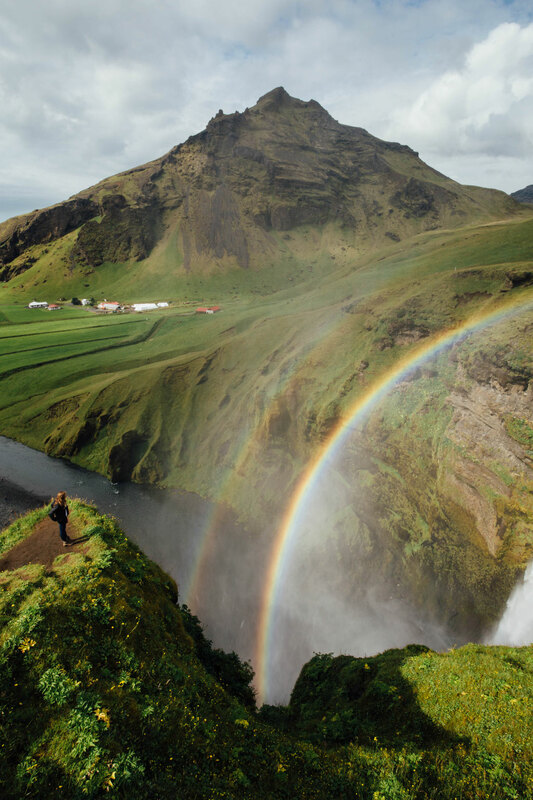 On a sunny day you will be able to see rainbows from up above and stand in the presence of the raging waterfall. Make sure to get to the site early. Around 9am bus tours from Reykjavik start to swarm the place with overzealous tourists. After Skogafoss continue east along the south coast. After a mere 10kms come to a halt. This time you will be visiting the famous crash site of the DC3 plane on Sólheimasandur Beach, Iceland. Blink and you will miss it. Bear in mind that it's private land. It used to be possible to drive the vehicle directly to the crash site, but since Iceland's extremely fast tourism growth the owners of the land got over the fact that hundreds of vehicles were driving through their land on a daily basis and banned it. Now the only way to visit it, is by hiking in the 4km. 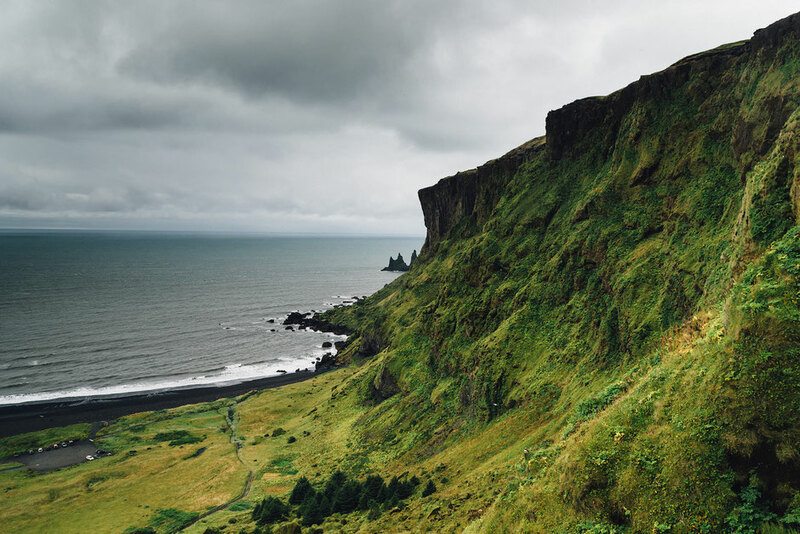 Closer towards Vik, where you should spend the 2nd night, is a coastal view point called Dyrhólaey. The roadside turn off is very well marked. 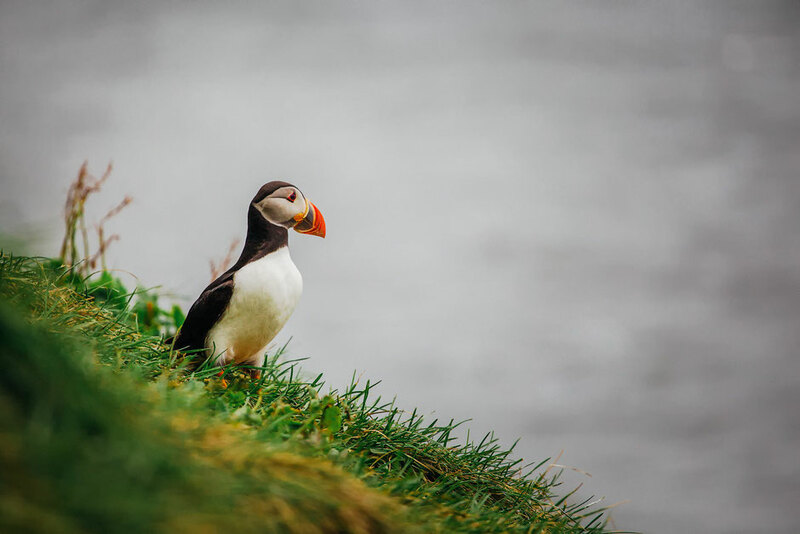 The cliffs that stand above Kirkjufjara black sand beach are home to a big colony of puffins! Take the time to walk around and spot the little cuties hanging out on the cliffs and flying out into the sea. Your last stop before getting to Vik are the Reynisdrangar basalt sea stacks at the Reynisfjara black pebble beach. If you had enough of exploring for the day you can try and catch sunrise here the next morning. It's only 10 min drive from the town of Vik, where you should spend the night. The next stop on your 10 day Iceland road trip itinerary is Fjaðrárgljúfur located 70km and 50 min drive east Vik. 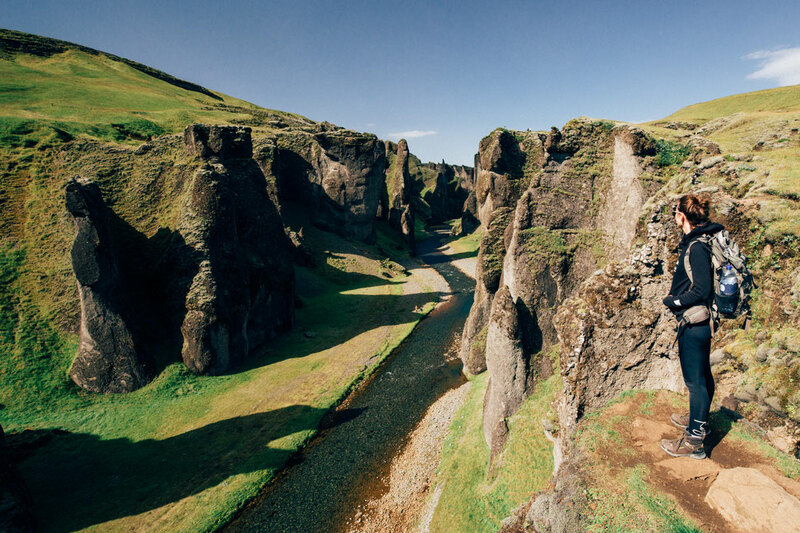 This incredible canyon that’s been carved by the Fjaðrá river is 2km long and at places 100m deep. It will be a good spot to stretch your legs in the morning of your 3rd day. 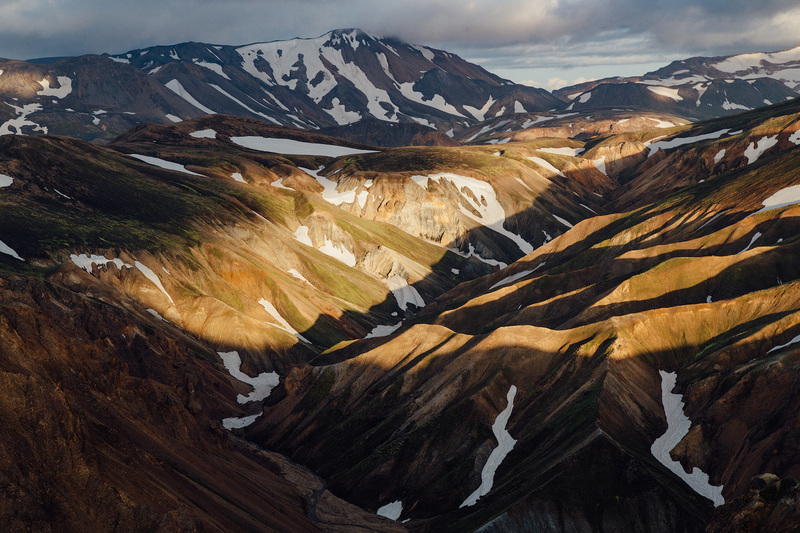 Skaftafell National Park is home to many glacial tongues. If hiking on a glacier is on your bucket list, with stunning mountain backdrop, this is one of the best places in Iceland to do it. I've hiked on a glacier in Patagonia, Argentina and till this day it remains one of my favourite activities I've ever done. There is a campsite nearby where you can stop for the night. I've marked it on the map. 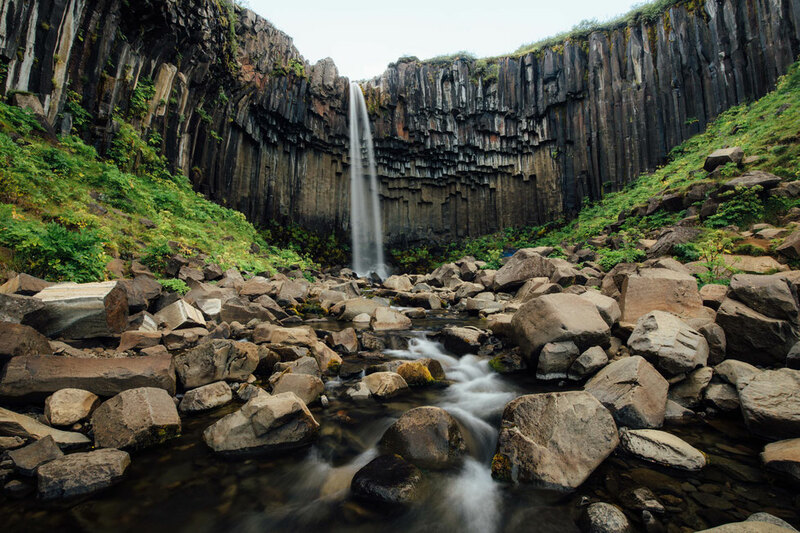 Once you set up your camp take a hike to the beautiful basalt column framed Svartifoss waterfall. You've probably realized by now, that Foss in Icelandic means Waterfall, so keep an eye out for any signs that end in Foss. The short walk from the campsite to the waterfall should take around half an hour. If your legs are still up for it you can extend the hike into a longer loop and continue the hike from the waterfall to the viewpoint of the skaftafell glacier tongue. I have travelled around Iceland for three weeks in August last year during the peak season. Due to such a long stay my budget didn't allow me many splurges, but If I had to pick one thing I would like to go back to Iceland for (and there are many) it would be the scenic flight above the glacial river beds and volcanic eruption sights. 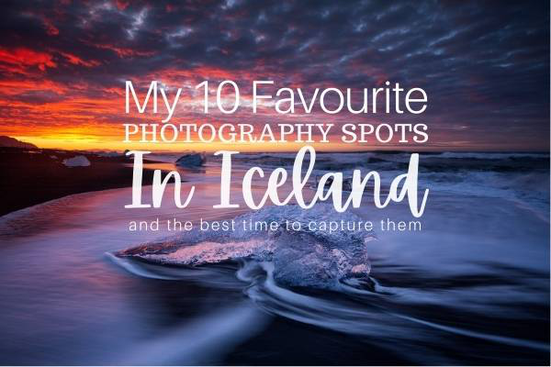 This will be your chance to see and photograph Iceland from a unique perspective. There is a small privately owned airport where the flights depart from. If there is one thing you should splurge in Iceland this would be it. Day 4 will be another day full of exciting spots! The short drive from Hof to Höfn will take you around an hour and a half (120km) if you were to drive continuously. However there are two famous stops along the way that will significantly slow you down. The first is called the Jökursálón Glacier Lagoon and the second is the nearby diamond beach. Try and leave Hof early and get there for sunrise! The Diamond beach remains my absolute number 1 favourite photography spot in whole of Iceland. I was blessed with spectacular light on the morning I was photographing it. Further 120 km down the Ring Road will take you to your base for the 4th night - the town of Höfn. 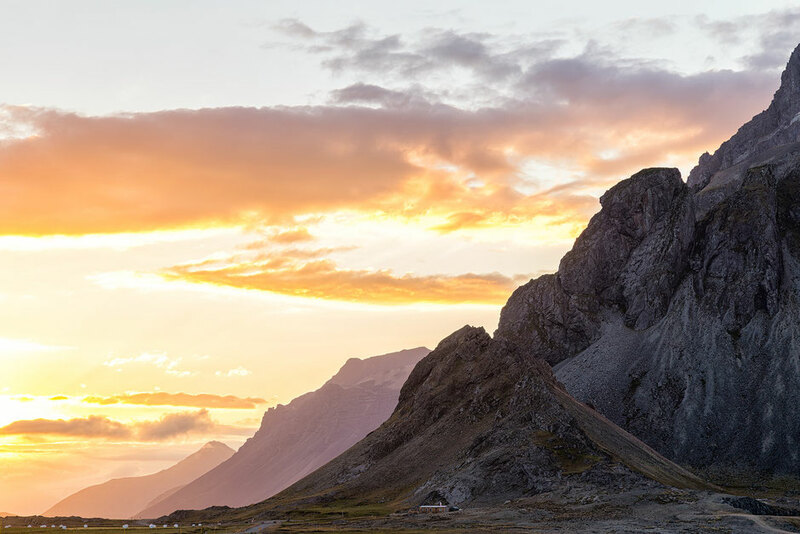 Stokksnes, with the famous Vestrahorn Peak is only a short drive away from the town centre and should take only 15 minutes to reach. Try to catch the sunset on the beach. Again this is a private area and the owner of the land charges 800ISK for visitors to the beach, but I arrived late and there was no one to collect the fee from us. Now that you’ve explored the south coast sufficiently you can start heading up north. This part of the itinerary includes a lot of driving but trust me it’s worth it and I’ve designed it so you’ll be taking regular stops. Continue north east on the Ring Road until you get to Öxi. To cut down on travel time from Öxi you can take the short cut on the road number 939. After around 20 minutes of a scenic mountain ride the road rejoins the number 1 saving you quiet a bit of kilometres! Driving north from Höfn on the Ring Road will take you close to two waterfalls: Litlanesfoss and Hengifoss. These two not very visited waterfalls in the east of the island are spectacular in every way and are what I consider to be hidden gems. The drive from Höfn half way up the east coast to these waterfalls should take around 3 hours (200km). I hope you are not fed up with waterfalls yet, because you are about to witness some of the most impressive waterfalls in Iceland. After continuing north for another 3 hours, the next thing on the agenda is Dettifoss, the most powerful waterfall in Europe. 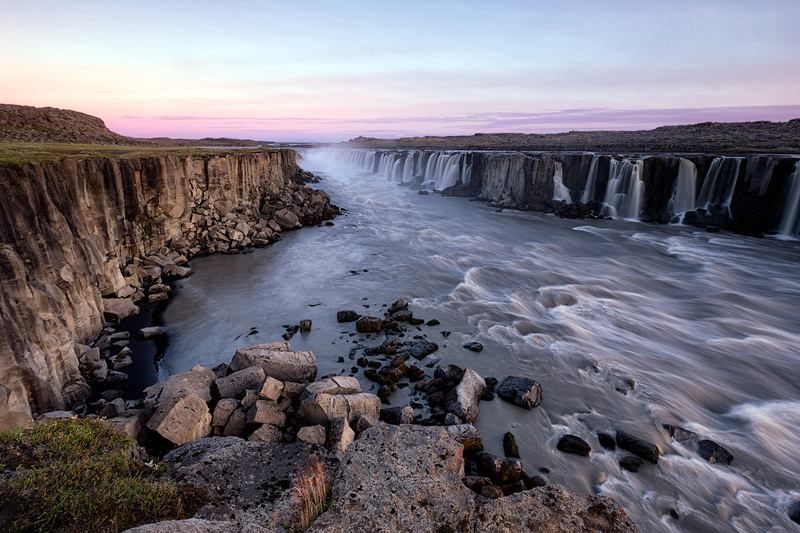 Dettifoss can be reached by two roads, one to the east of the canyon (864) it forms, and one to the west (862). I think the east side is better. There is also a great hiking track path from Dettifoss a few kilometres further north to Selfoss, which is just as, if not more spectacular than Dettifoss. The whole area is very remote with no nearby hotels. Try to catch a sunset at either of the waterfalls and continue on the Ring Road to Myvatn where you can stay for the next two nights. If you’re up early enough on the 6th day you can enjoy a sunrise at Goðafoss. 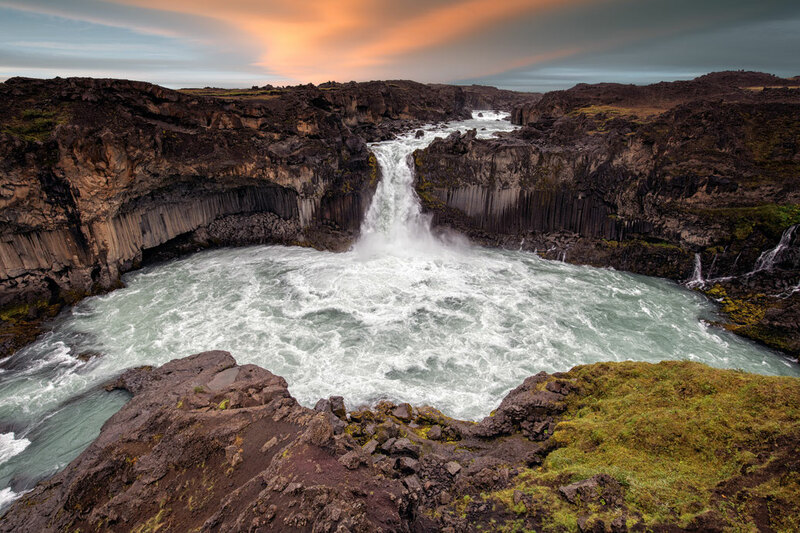 This impressive waterfall got its name when the Icelandic people changed over from following the norse mythology to christianity. To honour their new beliefs they threw all statues of the old gods into the waterfall and named it Goðafoss, the Waterfall of the Gods. Sounds so Game of Thrones, doesn't it? I think the Gods were angry with me, because the weather couldn't have been worse when I visited this spot. Aldeyjarfoss is an hour and a bit south of Lake Mývatn. A beautiful waterfall tucked away below lake Mývatn that not too many people visit so chances are you’ll have the whole place to yourself. A rarity in Iceland. The road to this waterfall isn't ideal so take extra care when driving on it. Spend the rest of the afternoon whilst taking a break from driving in the hot springs in Myvatn. A great alternative to the overpriced and super touristy blue lagoon, all at less than half of the price! Myvatn and the surrounding area is geothermal heaven. The intense sulphur smell won't let you forget that! It's time to head to the Snæfellsnes peninsula in the west. This 450km drive from Goðafoss to the peninsula will be a long one. Once you get to Akueyri the second largest city in Iceland, and if the day is nice take the lesser known route around the northern Fjords (marked on the map). It won't take much longer, but it will give you plenty of photo opportunities. A must stop on the way to Snæfellsnes are natural hot springs called Grettislaug (see the map). They cost 1000ISK and operate on honesty box basis. The water in the springs is pleasantly hot and the view over the Fjords is second to none. Out of all hot springs I have visited in Iceland these ones were my favourite! 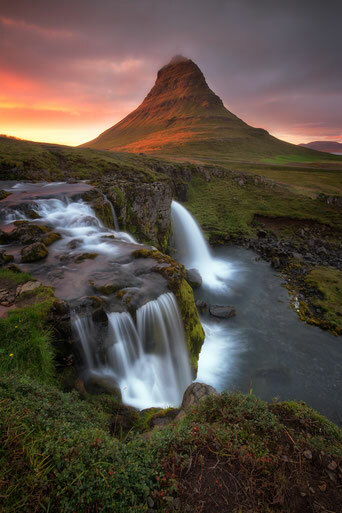 After driving for most of the day you should be able to make it to the famous Kirkjufell mountain before sunset. Framed by Kirkjufellsfoss, and located right next to a lagoon that gives perfect reflections on a windless day, it's certainly not to be missed by any photography enthusiast. It’s a short drive (5 minute) from the town of Grundarfjörður. Once again a ten minute walk away from the main falls can be very rewarding. HINT: go upstream and you’ll find more falls!! On the way back to Reykjavík from the peninsula you will be treated to the spectacular views of the roads beautifully embedded into fjords. The journey should take just over 2 hours. It will give you enough time to drop off your rental car, repack and restock your supplies before heading into the Icelandic highlands. 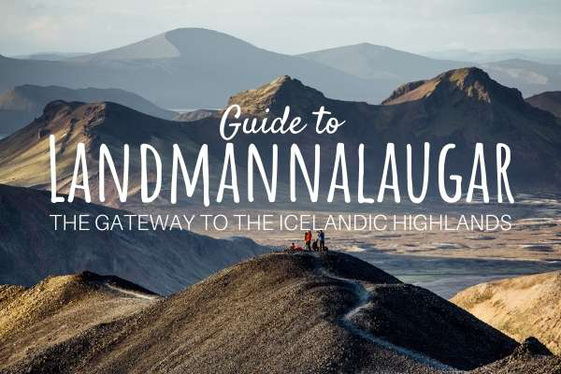 Landmannalaugar is literally going to be the cherry on the top of your road trip cake. It was my favorite spot in Iceland and I am definitely planning on going back there in the future. I have covered everything you need to know about this place in my guide to Landmannalaugar. To put it short you can drop off your rental car in Reykjavik on the last day and jump on an afternoon shuttle bus to Landmannalaugar, where you can stay on a campsite or backcountry huts for 2 nights. All roads that lead to Landmannalaugar are so called F-roads accessible only by 4x4. If you are not travelling Iceland on a budget and don't mind spending loads of money on renting a 4WD vehicle, then by all means go for it and drive to Landmannalaugar yourself. However if you don't want to skip this gem, but don't have unlimited funds for your road trip, then booking a shuttle will be more cost effective. 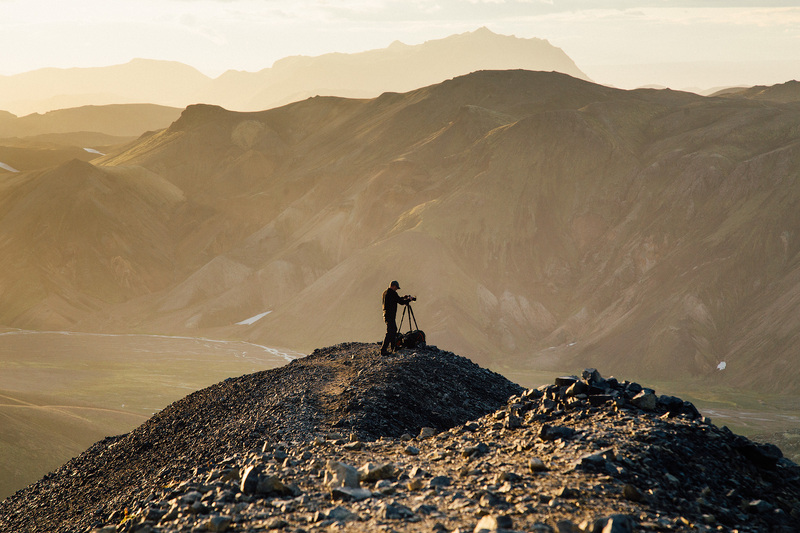 Now head over to my post about Landmannalaugar to see what awaits you there. Note: If you didn't bring camping equipment on your trip you can rent it in Reykjavik. Just make sure to reserve it ahead of time. 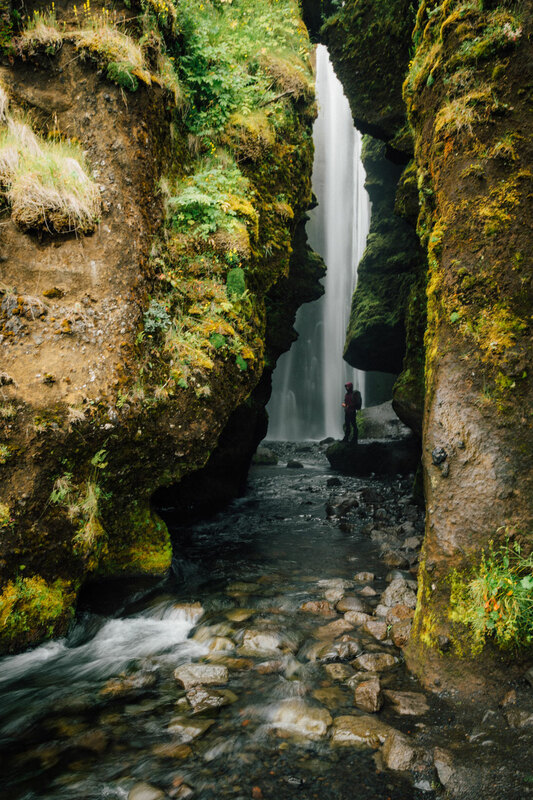 Below are some links that will become useful in planning your road trip, booking your accommodation and renting a vehicle for your trip in Iceland. Motorhome Republic - find you perfect road trip campervan with this easy to use booking search engine. Discover Car Hire - if you are after renting a smaller car, this is the best website for comparing the prices. Road.is - A website where you can check the current road conditions. Very useful for travelling off season. Hot Pot Iceland - This website will guide you to some of the best and natural hot springs in Iceland. You can thank me later.